Tarragon is growing by leaps and bounds and the delicate, fresh anise-like flavor pairs beautifully with salads, eggs, fish and chicken. Today we made a simple roast chicken stuffed with tarragon. I picked a small handful of tarragon shoots cutting to the soil line to encourage new growth. As mentioned in earlier posts I grow tarragon in a container. To infuse the tarragon flavor throughout the chicken I gently lifted the skin and pressed tarragon under it on as much of the chicken as possible. I placed the stems in the cavity along with several more sprigs. Notice the pattern tarragon makes under the skin. Remove giblets and any excess fat that can be trimmed away. Work the tarragon under the skin. Mix oil, mustard, salt and pepper together and rub over chicken. Place additional tarragon inside cavity, reserving one tablespoon leaves. 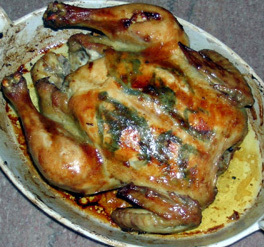 Place chicken in a small roasting pan and place in oven. I started with the breast down for 45 minutes. Every 15 minutes or so I give the pan a little shake to keep the breast from sticking. When back has browned carefully turn the chicken and continue cooking until breast is browned in approximately 45 minutes. An instant thermometer placed in the thigh or breast will read 170 degrees when done. When thigh and leg move easily and juices no longer run pink chicken is done. Thermometer test is easier. Strain and defat juices, salt to taste and add one tablespoon minced tarragon. Use juices as a sauce. Heat and add a little white wine, white vermouth or apple juice until right consistency. A couple teaspoons of cream smooth the flavors if you desire a little extra richness. Let rest 15 to 20 minutes before carving and serving. Plan now for summer water conservation. Choices include drip tape, porous leaky pipe, and drip emitter kits. Combine any of these with timers and you are delivering proper amounts of water to each area of the garden. Avoiding overhead watering reduces disease and increases yields. Less time spent on weeding is a significant advantage. Obviously, a bed of mesclun, a row of tomatoes, and a container garden all have differing needs and there’s a proper setup for all. Garden supply stores are better stocked in spring than midsummer when the water crunch hits. Take a look around now to determine which is best for you. Porous leaky pipe made of recycled tires can clog if your water has a high sediment content. If they are only going to be in place for a year and soon end up in a landfill you may want to select a different system. Drip Irrigation for Every Landscape and All Climates by Robert Kourik is considered the bible on this topic. 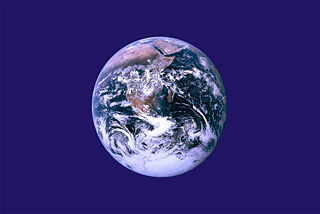 April 22nd marks Earth Day, a world celebration of our beautiful planet. With so many shared world concerns let us pause and enjoy what we have. Stop for a moment, get outdoors and look around at the amazing wonder of spring. Plant seeds, set plants and soon you have a garden. With all the discussion and good reasons for eating locally, growing some of our own food in a garden is a first step. Indeed growing food a few steps from your door leaves no carbon footprint. My parents, Nick and Edith Nichols, established Nichols Garden Nursery with a philosophy that guides us today. N.P. Nichols wrote “our purpose during these years has been to bring people closer to nature through gardening. Nothing can equal the sense of accomplishment that comes from growing hundreds of pounds of vegetables from a few ounces of seeds”. Celebrate Earth Day. Surely there is no recent holiday with a more obscure origin. The date is listed as both April 23rd and April 25th. It seems to have no presidential decree or any notable history. It reminds me to use the shredded zucchini frozen last fall. It’s almost time to plant more zucchini! Our current favorite variety is Salman F1 hybrid, a pale jade color, productive with a delicious mild flavor. If any readers know more about this holiday please add a comment. 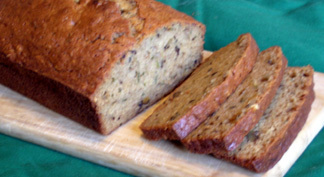 Meanwhile we shall enjoy our zucchini bread, one loaf for a company dinner today and one to take to work on the 23rd. Preheat oven to 350 degrees. Toast nuts for three to five minutes in pre-heated oven. They keep cooking after you remove them so slightly under toasted is best. Grease and flour two 8” x4” loaf pans or spray pans with no-stick cooking spray. Place a piece of parchment or waxed paper against the two long sides of each pan and let it drape slightly over the edges. Trim with scissors if necessary. Smooth paper against sides and lightly respray. By using this method any quick bread can be easily removed with absolutely no sticking. Lightly beat the eggs with a whisk. Stir together oil, vanilla and sugar, followed by zucchini. Combine flour, cinnamon, nutmeg, baking soda, baking powder, salt and nuts in a large bowl. I sift 1 cup of flour with other dry ingredients except nuts, and then stir it all together. Stir egg mixture into flour. Divide the batter into prepared pans. Bake loaves for 55 minutes then check with a toothpick or bamboo skewer, if it comes out dry, bread is done. If batter clings to skewer bake another 5 minutes or until done. Place pans on cooling rack for ten minutes. Turn over to remove from pan and carefully remove paper. Let loaves cool on rack. Do not wrap or store until completely cooled. *My packages of zucchini were carefully marked as 3 cups when I froze them. When measuring after thawing it was now two cups without discarding any liquid. So it’s three cups fresh and two cups frozen and thawed. Tomorrow, Saturday April 5th, Keane and I will be at Gardenpalooza with seeds, and Yacon plants. Come to us with your gardening questions. Mention you’ve seen this note on The Gardener’s Pantry and select a free seed packet of your choice. Gardenpalooza is a yearly local event held at Fir Point Farms in Aurora, OR on Airport Road. We’ll be in the lovely big greenhouse with other nurseries and The Chinese Classical Garden. I always pick up new plants at this show because there is such a great selection. For those of you who out of the area look for local garden events where you can directly ask the grower how to grow the plant and find interesting plants that never show up in the big box stores.